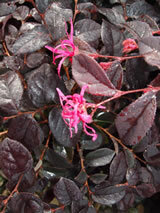 Delightful shrub with graceful long arching branches clothed with burgundy leaves. These emerge pinkish-red in spring. In a warm site bright pink fringe-like flowers appear in spring. Hardy to cold once established, prefers good soil that does not get too dry. Best in semi-shade. 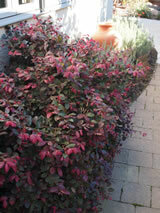 Good for the shrub border or trimmed as an informal hedge.